Does My Child Suffer from Asthma? What is asthma? I'm so glad you asked. Asthma is the most common chronic illness in children, affecting 5%-10% of children in the United States. 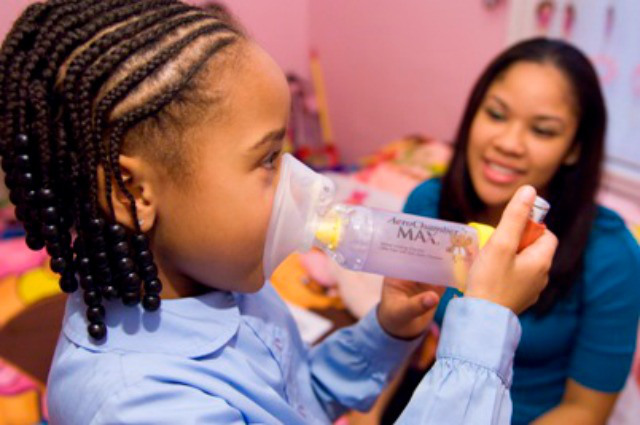 1 in 6 African American children are diagnosed with asthma. Children with asthma suffer from the triad of airway inflammation, smooth muscle hyper-reactivity, and reversible airway obstruction. Numerous triggers can precipitate an asthma flare up, including upper respiratory tract infections, sinus infections, exercise, exposure to cold air, weather changes, exposure to aeroallergens (e.g., dust, cockroaches, animal dander, pollen, grass), exposure to strong odors (e.g., cigarette smoking, strong chemicals), and emotional states (e.g., fear, laughing, crying). Yes, a laugh attack can affect your child's asthma. Wheezing is the classic presentation of asthma, but other symptoms include chronic coughing (cough variant asthma), shortness of breath, and chest pain or tightness. Please see your child's primary care physician if your child is having any of these symptoms. For most patient's with asthma, ideal therapy includes the use of a daily anti-inflammatory medication with a bronchodilator as required to treat breakthrough symptoms. Anti-inflammatory medications include mast cell stabilizers, inhaled steroids, and leukotriene inhibitors. Beta 2 agonists are the most effective bronchodilators. Non-pharmacologic management entails patient education (to improve self-management), environmental control and prevention skills (to decrease the likelihood of developing an asthma attack), and home monitoring with a peak flow monitor (to objectively assess pulmonary status so that interventions can be instituted and the effects measured). Please make sure your child has their inhaler with them at all times especially if they play sports. Asthma is a very serious illness and should be treated as such. In my 15 years of practicing I have had one patient die from asthma complications due to improper treatment. Parents please be aware of your child's asthmatic symptoms and treat them properly. Do not hesitate to leave a message on the website or with the office concerning your child's symptoms.